Let’s talk charity, today. My basic belief is you can never do enough – but my limited organization skills seems to set their own goal posts. Fortunately, I have many kind and generous readers, who make up for it. So here are some quick updates on the various things I’ve been up to, that I could not have done without your help and support and belief in All Things Good. Pat Rothfuss (he’s so dreamy) asked me to contribute to his astonishingly successful Worldbuilders charity, which works closely with Heifer International. Heifer helps people raise themselves up out of poverty and starvation, promoting education, sustainable agriculture, and local industry all over the world. And because Pat is Pat, Worldbuilders has been enormously successful. This year’s push is closing on on the $500,000 mark, which is mindblowing. To that end, Steve Jackson Games and I have a Worldbuilders auction item up: become an official Munchkin card! This is a very rare opportunity to actually become a Munchkin card! 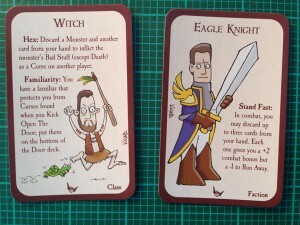 The winning bidder of this auction will be drawn as a Munchkin, by me. MEEEE! 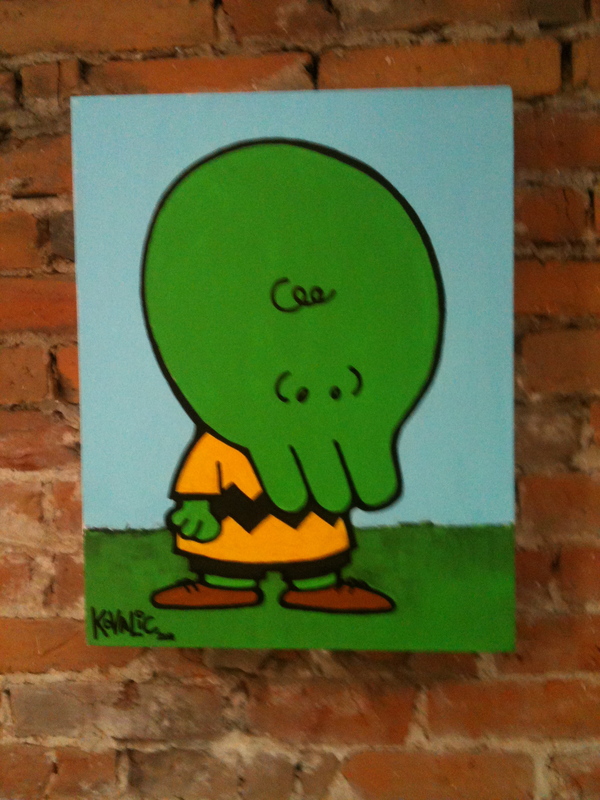 This art will be used as an official Munchkin card. The card will be released in a Munchkin core game or supplement by Steve Jackson Games. 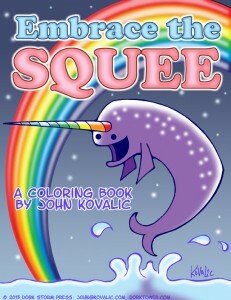 The winner will also get the original artwork, signed by John Kovalic, and a signed copy of the Munchkin game that contains their card. Previous winners from similar auctions – these ended up raising thousands of dollars from wonderful charities, in the US and Ireland. We only offer one or two such opportunities a year, so jump on this, if you can! 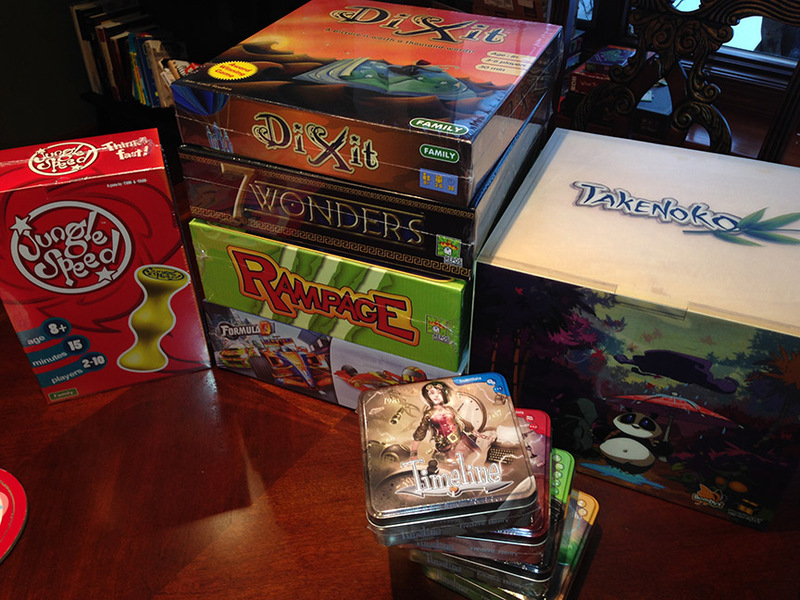 I’ll also be doing an Act-of-Whimsy-slash-Stretch-Goal for the drive, as well as contributing signed copies of Munchkin games, rare Munchkin cards, and Dork Tower for both the auction and the lottery. More news on that as the auctions get posted. 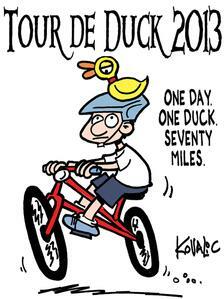 Bike the Barns Update – Coloring Books a-Comin’! Last year, I cycled 70 miles with a Duck of Doom on my head during Bike the Barns, to raise money to benefit the Fair Share CSA coalition. I promised backers two things: a Very Geeky Coloring book, and a certificate to anyone pledging $10 or more, to start a Munchkin game at Level 3. (This is Steve Jackson Approved, by the way). You have no idea how out-of-shape I was, when I pledged to do this! I had hoped to raise $2,000, but you magnificent people pushed it past $4,000 – you all contributed more than 10% of the event’s total! 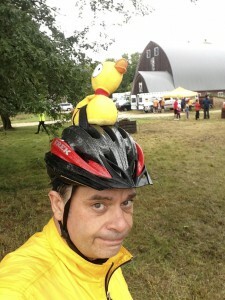 Anyway, it was raining and miserable and I had a ridiculously absorbant duck on my head that just got heavier as the ride went along, BUT I DID IT! A dream to not look so ridiculous. Good news! The coloring books are almost done! They’ll be uploaded to Drive Through RPG sometime next week, I hope, and I can get download code to backers soon after. If you missed out, you can still get the coloring book – all it will take is a donation to charity, on the web page! Coming soon, because YOU FOLKS ROCK! The certificates should be sent to press soon. These will be VERY NICE postcards that I’ll mail to backers. I’ll let everyone know when I need to start collecting addresses. I’m still (slowly) working on the sketches for the Real Love Orphanage, in Haiti, water tanks that we bought. With luck, I’ll get one or two sketches done per week. I’m sorry these are taking so long, and I hope the pace increases. But a lot of people chipped in to help! We needed to raise $700, and in the end it turned out to be closer to $2,500! 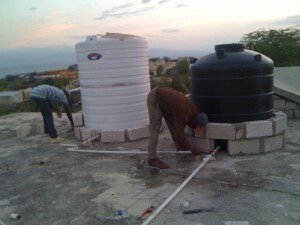 The water filtration system being installed at the orphanage, in Port-au-Prince. Because the money was raised by gamers, we named the tanks Gary and Dave, in honor of Gary Gygax and Dave Arneson! That said, the orphanage still has needs – many, many needs. I like the idea of helping a particular group of kids directly, and I’d like to try to do much, more for them. I deal with plenty of large, wonderful charities that help thousands of people. But helping a handful of kids, directly, holds its own magic. Here are some children we can see, hear from, and get reports from. 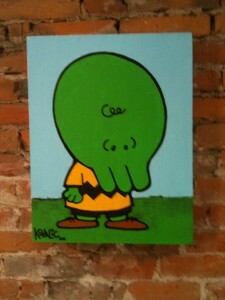 To that end, I sold one of my paintings – Charlie ‘Thulhu – to help raise some money for them. It ended up going for $1,250, which will go a long way towards books, pens and school supplies for the kids for the coming year. I’ll be doing more – hopefully much more – but right now, I want to make sure I get those sketches out to everyone from that first drive. 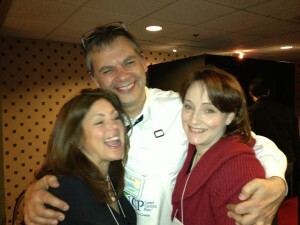 United Cerebral Palsy of Dane County Celebrity Banquet & Auction. Lastly, I’ll be a “celebrity waiter” (no, no – seriously – try and keep a straight face, here) for the United Cerebral Palsy of Dane County Celebrity Banquet & Auction. This is – I think – the 21st year I’ve done this event, and it’s a hugely important one to me. The second year I did it, I met my wife-to-be at it! So not only does the charity do amazing things for kids and families in the area, it also brought the love of my life into my world. VERY LEVEL of personal waitservice! This came in from Asmodee alone! Loot, lads! Look at the LOOT! Hope to see at least some of you at the Celebrity Banquet & Auction. Yes, it’s United Cerebral Palsy of Dane County’s main fundraiser of the year – but it’s also a terrific, fun, silly time. And it’s for a wonderful cause!